For the true fantasy football addicts among us, below you will find my “never too early” 2019 tiered rankings for the quarterback position with accompanying analysis. Well, this one is easy. Mahomes stands in a tier all to himself. 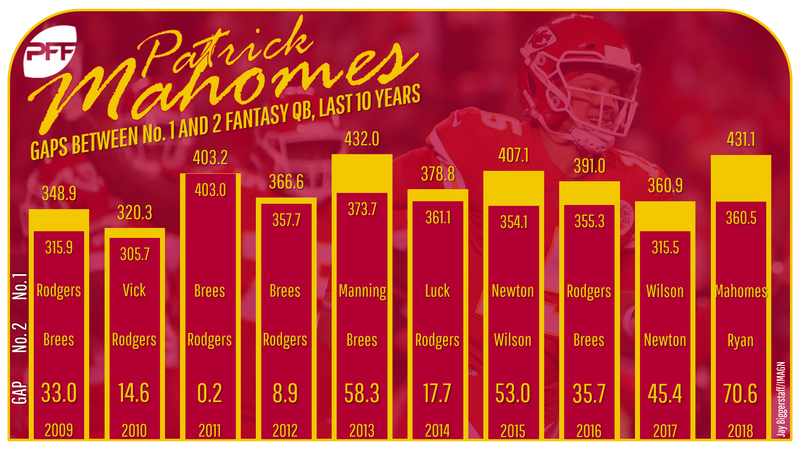 In 2018, his first full season as a starter, Mahomes scored the most fantasy points (total or per game) of any quarterback in any season all-time. Watson averages 21.8 fantasy points per game over the past two seasons, second-most to only Mahomes. … Since 2015, Rodgers ranks third (20.4) behind Mahomes and Watson, with Luck right behind him (20.2). All should benefit from improved receiver play in 2019. There were some early concerns regarding Newton’s health, but that no longer seems to be a serious worry. Since entering the league, Newton has ranked fourth, fifth, fifth, seventh, first, 14th, sixth, and seventh in fantasy points per game. … Ryan has ranked second in two of the past three seasons, and his 2018 season actually ranks 14th-best all-time. … Like Ryan, Brees has been a hallmark of consistency throughout his career. He finished top-six at the position in fantasy points for 11 straight seasons but has fallen off slightly over the past two years, ranking 11th and ninth. Roethlisberger finished third in fantasy points last year, but it was just the second time he finished within the top-10 over the past nine seasons. He might also now have to contend with the departure of Antonio Brown. … Wilson has finished third, second, 14th, first, and eighth in fantasy points over the last five seasons, but, like Brees, now suffers from a lack of volume. 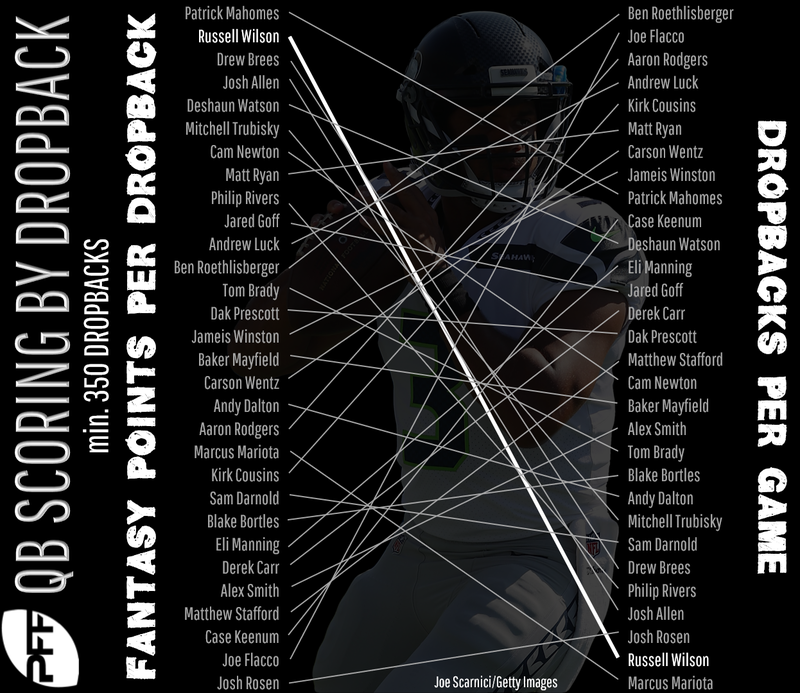 Of 31 quarterbacks, Brees ranked second in fantasy points per dropback but 25th in dropbacks per game. Wilson ranked third and 29th, respectively. … Brady will probably go down in history (entirely deserved or not) as the greatest football player of all time, but that doesn’t mean he’s worthy of a top fantasy pick. He’s finished 16th, third, and 12th in fantasy points over the past three seasons. … Wentz was on the right side of variance in 2017, before getting a little bit (statistically) unlucky in 2018. Still, he ranks fifth among all quarterbacks in fantasy points per game over the past two seasons, or second-best among all quarterbacks to play in as many games. Now we’re in the tier of quarterbacks I wouldn’t really feel quite comfortable drafting as my QB1 without another competent backup. Rivers has finished as a QB1 in four of the past five seasons, but only with one top-10 finish (eighth in 2017) and a low of 14th in 2018. He’s dependable but unexciting. … Over the past two seasons Goff ranks seventh at the position in fantasy points, but the end to his 2018 season was worrisome, averaging 11.3 fantasy points per game over his last eight games (postseason included). … While I love Mayfield’s talent, like with Brees and Wilson, I think volume is a concern. Though any of these names could finish as a QB1 and it wouldn’t surprise me, I wouldn’t feel totally comfortable drafting any of these players as my QB1. After finishing as a QB1 for three straight seasons in Washington, Cousins’ 11th place finish felt like a disappointment given the receiving upgrade in Minnesota. … Prescott isn’t an exciting name, but he’s finished sixth, ninth, and 10th since entering the league. … Trubisky graded out 33rd of 38 qualifying quarterbacks but did rank 10th in fantasy points per game last year. … Jackson and Allen look like good values for “Konami Code” advocates, but will be hard for anyone else to stomach. From Week 11 until end of the regular season, Allen ranked second and Jackson 11th (of 32 qualifying quarterbacks) in fantasy points per game. … The fantasy production hasn’t been there for Garoppolo, but hopes are high, as Kyle Shanahan’s starting quarterback. Shanahan was able to coax competent fantasy production out of C.J. Beathard and Nick Mullens in Garoppolo’s injury absence in 2018.